Immunogen: Cross-linked rabbit liver Metallothionein I and II. 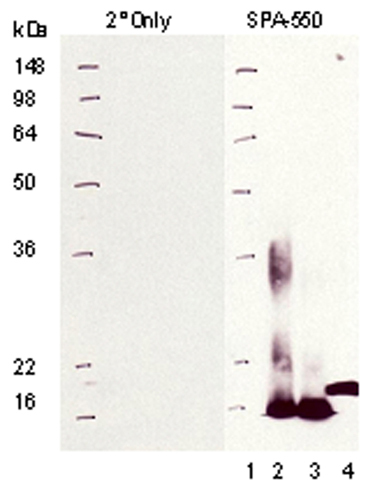 Application Notes: Detects a band of ~15kDa by Western blot. Scientific Background: Metallothioneins (MTs) are a class of ubiquitous, low molecular weight, cysteine-rich, metal binding proteins that function in the metabolism of zinc and copper. MT protects against exposure to toxic metals such as mercury and cadmium as well as a variety of other stress conditions. There are four mammalian MT isoforms: MT-I, -II, -III, -IV, each of which is encoded by individual genes. MT expression is induced by heavy metal cations, starvation, elevated temperature, lipopolysaccharide, inflammatory cytokines, free radicals, and ionizing radiation. Western blot analysis of Prod. No. ADI-SPA-550: Lane 1: MW marker, Lane 2: MT I, Lane 3: MT II, Lane 4: Mummichug CdCl2. Immunohistochemistry analysis of human uterus tissue stained with Metallothionein, mAb (UC1MT) at 10µg/ml.